Many of us have watched the reports from around the world on the increasing coverage of mass shootings, both on campuses and beyond. While Canada has had only two active shooter situations at a post-secondary campus since 2000, it is one of the risks we are addressing to support all of the important work being done on campus safety and security at UBC. It is extremely unlikely that you will ever encounter an active threat on a UBC campus. You are in a very safe place.Even so, it could happen either on campus or somewhere else in your lifetime. If you determine it is safe, RUN (get out)! This is your first and best option. If getting away is not possible, find a place to HIDE. As a last resort, and if you feel that your life is in danger, FIGHT. 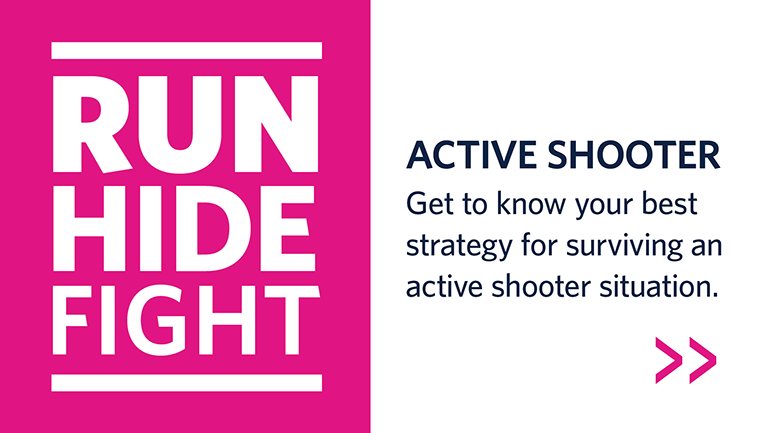 For more details, visit the Active Shooter information page.